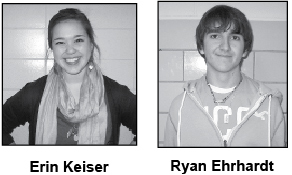 Senior Erin Keiser and junior Ryan Ehrhardt earned the honor to perform in Madison, Wisc., on Saturday, Feb. 11 for the North Central – American Choral Directors Association (NC-ACDA) jazz choir. To be able to perform for the NC-ACDA, they had to go through an audition process. “Before I even could think about performing, I had to audition. The audition process was fairly simple.” Keiser said. NC-ACDA includes North Dakota, South Dakota, Nebraska, Minnesota, Iowa and Wisconsin. Out of the 650 people that auditioned, there were only about 150 selected to take part in the jazz choir. Even after learning the four pieces, the choir wasn’t done working, “Once we got to Madison and began rehearsals, we were given an additional piece that we had never seen before and learned it as a choir in the few short days we were together,” Keiser said. “The concert was fantastic. It was incredible being able to perform in such a large and beautiful concert hall,” Keiser said. Being a part of the NC-ACDA jazz choir is a very high achievement, and is more than just singing in a chorus. “It’s so much more than simply another music festival.” Keiser said.